?, originally uploaded by indiaeden. 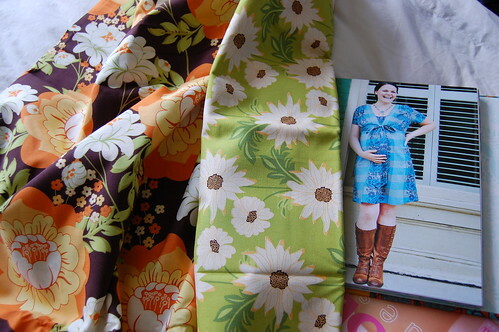 Is that what I will look like if I make this dress in these fabrics? Especially considering my bump is already, at 29 weeks too large for the largest size, and I'm going to have to alter the pattern. I think my indecision is probably my answer. i think the green material would look really nice. Really summery. Its the least sofa-y one of the two and even if you do look like a sofa you'll look like a very beautiful one. I could imagine the green fabric real good! I love both, and anyhow, who wants to be clothed in mothercare? I say make one in each! I think you'll look gorgeous - such pretty fabrics.